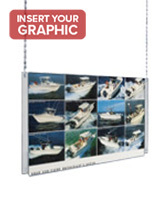 11" x 17" 22" x 28"
These hanging sign systems will create a 8.5" x 11" overhead signage panel. Each kit includes an acrylic frame, 60" mounting chains, toggle bolts for plaster/lathe ceilings and ceiling clips for drop ceilings. 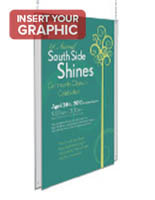 The letter-size sign systems can be used with single or double-sided graphics. 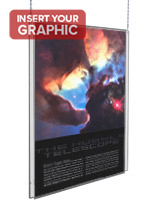 Each set as featured will hang one panel overhead and can be used with additional accessories to create multi-panel displays. 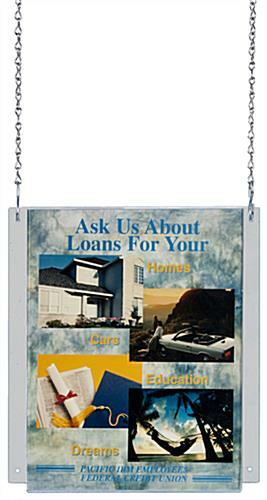 Ceiling mounted modular sign systems are ideal for creating high visibility signage in heavy traffic areas. 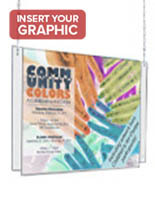 Versatile 8.5" x 11" frames are perfect for overhead or window displays. 10.0" x 16.0" x 0.25"